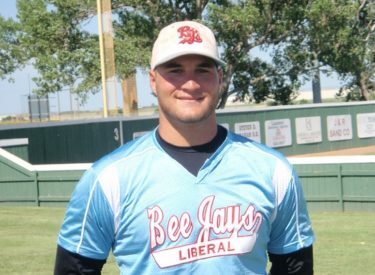 The Liberal Bee Jays are 18-11 in the Jayhawk but 10-0 in non league games after a 10-1 win at Junction City Thursday night. The BJ’s scored three in the first, two in the second, and one in the third to build an early lead. Blake Bergeron blasted his team leading sixth homer over the center field wall and went 3-5 with three RBI’s. Joe Vaskas made it back to back homers with his fourth of the year. David Masters added his second homer of the year. Newcomer Jamey Bradshaw started the game and pitched the first four inninggs. Nick Youpel earned the win with two innings before newcomer Quay Grant worked two innings and Will Alvis pitched an inning. Liberal is 28-11 overall and plays at 7 p.m. Friday night in Junction City for their last non league game of the regular season. In the Jayhawk League Thursday night, Dodge City blistered Hays 25-10. The A’s scored 14 in the eighth.